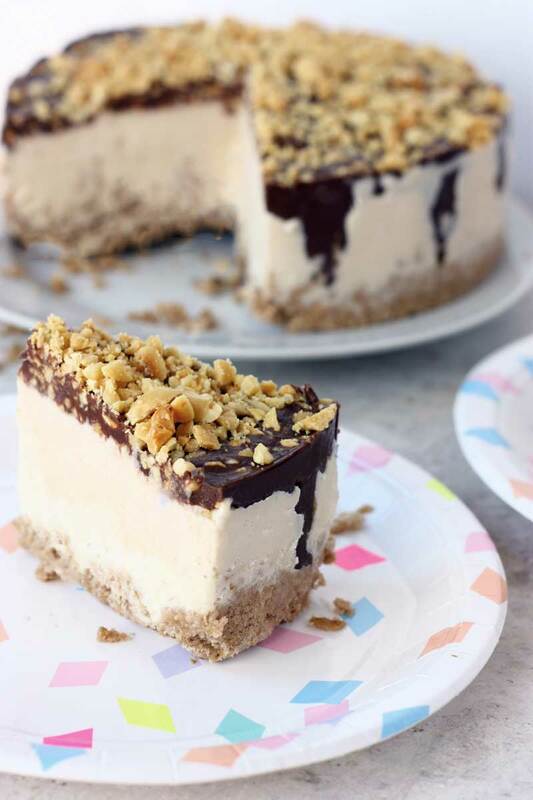 This Drumstick Ice Cream Cake was a 2016 grand prize winner in the Raise A Pint Event & Recipe Contest with So Delicious. With over one million Facebook likes, the proof is in the ice cream that Drumsticks are one of America’s favorite ice cream novelties. And really, how could it not be? How can a combination of a sweet and crispy waffle cone, crackle-top chocolate, roasted peanuts and vanilla ice cream be beat? It’s literally a sundae in a cone and a treat that no one should be deprived of—not even our gluten- and dairy-free friends. Thanks too So Delicious Dairy Free Very Vanilla Cashewmilk Frozen Dessert, Let’s Go … Gluten-Free Waffle Cones and Enjoy Life Foods Chocolate Chips, this festive and decadent Drumstick Ice Cream Cake provided my gluten-free and dairy-free son with his first taste of the flavors found in the classic Drumstick. You should have seen the smile that spread across his face. I hope you like it as much as he did! 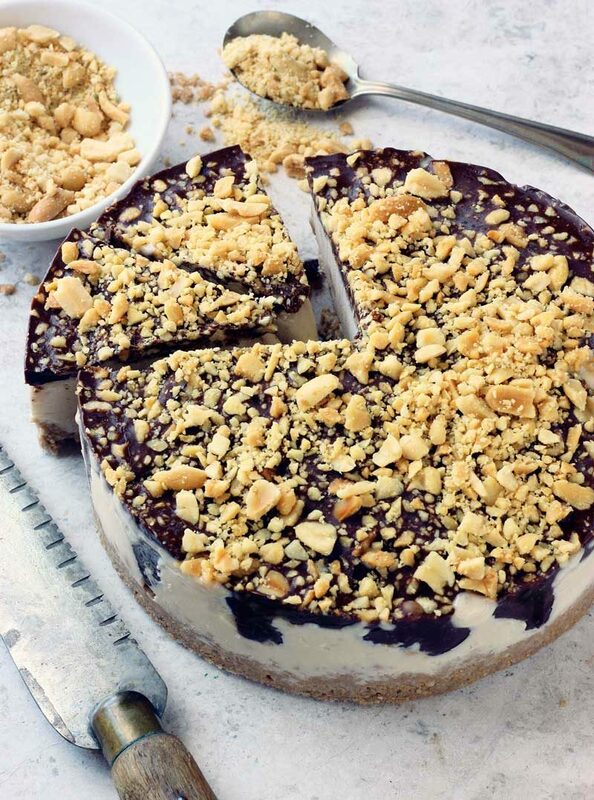 If this Drumstick Ice Cream Cake leaves you ice-screaming for more cool and creamy recipes, be sure to follow this summer’s Go Dairy Free Recipe Contest. 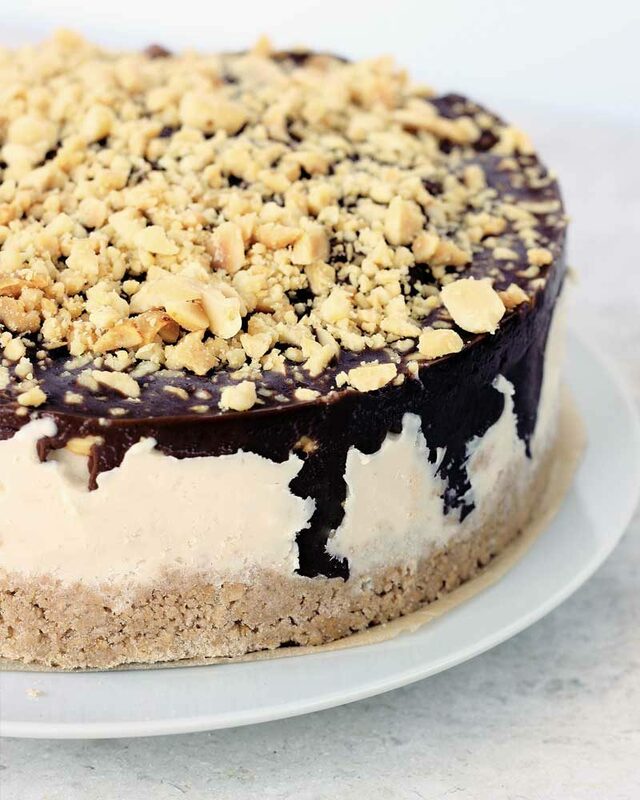 Go Dairy Free—the world’s most-visited dairy-free website—and So Delicious Dairy Free have challenged 21 bloggers, authors and recipe developers to create frozen treats using So Delicious Coconut Milk Frozen Desserts and Cashew Milk Frozen Desserts. All contest entries are dairy-free, most (if not all) are vegan and many are gluten-free. If you follow #RaiseAPint on Twitter, Facebook and/or Instagram, you won’t miss a drool-worthy treat or the chance to vote for your favorite! All recipes will be unveiled by July 24th, at which point the voting will begin. So raise your pint and savor this Drumstick Ice Cream Cake—Flo & Grace’s contribution to this sweet contest. Line the bottom of a 6 or 8-inch round springform pan with parchment paper. Remove ice cream from freezer and set aside until just soft enough to scoop and spread (10-20 minutes). In a small saucepan over low heat, melt chocolate chips and coconut oil. Remove from heat and set aside. In the bowl of a food processor fitted with the S blade, process cones to coarse crumbs. Drizzle in melted margarine and process just until combined. Press crumb mixture into prepared pan and pack down using a flat-bottomed glass. 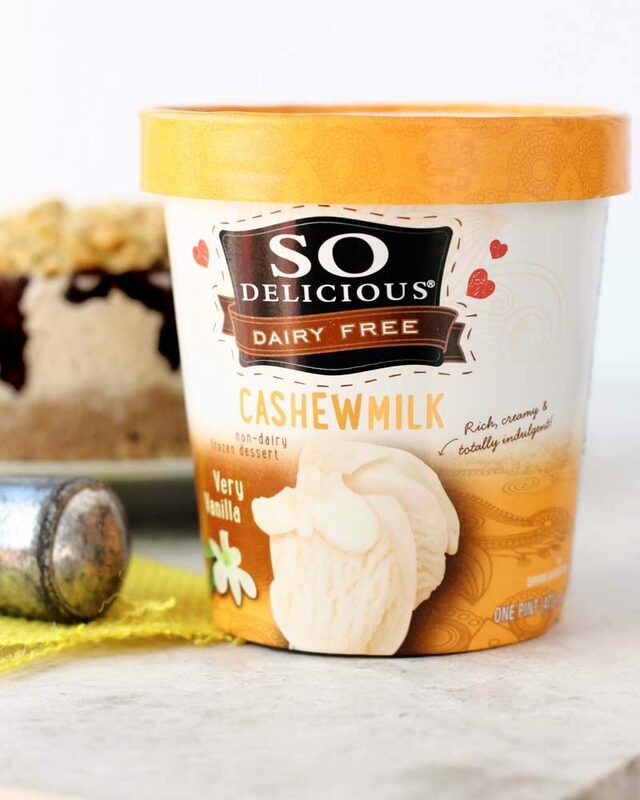 Scoop the So Delicious Very Vanilla Cashewmilk Frozen Dessert over the cone crust and gently spread, leaving at least 1/2-inch headspace and smoothing the top. Using a butter knife or chopstick, poke random gaps along the perimeter of the cake. Drizzle the melted chocolate over the the top and down into the gaps..
To serve, remove from freezer. Release from the springform pan. Let stand 10 minutes (take this time to admire your work! ), then slice and serve. Ingredients for this recipe were provided by So Delicious Dairy Free. Thanks Rebecca, I just love how pretty it turned out! Nutrimom, Ha! Never thought of it that way, but yes, a bigger piece indeed! I loved drum sticks, this sounds great! Drum Sticks are my all time favorite frozen treat! This looks great. This is so beautiful! You’ve made Drumsticks so much more appealing. Pinned! How fun turning a classic into cake form! Brilliant! A drum stick without the stick – I love it! This is absolutely brilliant! I used to love drumsticks and I’m sure this is just as delicious. what a great idea – I used to love those things! How can just a handful of ingredients create something so amazing? You have such a flair for recreating nostalgia Alexa! What can I add to these great comments except Yes! Lexie, you really are a winner, and not only with this prize winner cake. Aloha! Aww schucks! Thank you Poha! This looks gorgeous! And perfect for a summer party. Yum! Yes it is. I would make it one more time this season … but the leaves are turning already!